The Good-to-go trial scheme was launched on the 19th March. It is aimed at the daily on-the-go coffee drinker, and the objective is to help them recycle their takeaway cups more easily by offering them designated recycling solutions. The scheme is being launched in partnership with Westminster City Council, Veolia and Heart of London Business Alliance. Initially, it will be covering a number of trial areas in Westminster including streets around Victoria Station as well as Piccadilly, St James and Leicester Square. If the trial is a success, the scheme will be expanded throughout Westminster and eventually London. 30% of people in London buy at least one hot takeaway drink each week. This equates to millions of takeaway cups being used each week. 47% of people said they would be willing to hold onto their cup for longer if they knew they would be passing a purpose-built cup recycling bin. How can you recycle your coffee cups? To help people become a bit ‘greener’, Westminster street cleaners will be kitted out with a purpose-built coffee cup recycling bin. 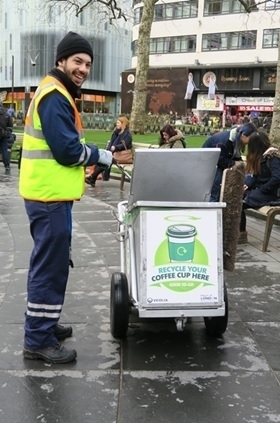 To encourage people to do the right thing, the street sweepers will have a brand new, reusable, cup to give away to the first person on their daily round that brings them a cup to be recycled. In addition to our street cleaners, you should also keep an eye out for designated on-street cup recycling bins that will be appearing in the designated areas during the trial. What happens to your cup after it’s recycled? There has been lots of discussion about whether a cup can be recycled or not? They can! And all of the cups that are collected in Westminster will be taken to Veolia’s local material recovery centre in London to ensure that all unwanted items are removed. This approach allows for a much higher quality of material that can be reprocessed into a new product. Take a look at what happens to all of the waste we collect after it has been delivered to the centre. With the help of Veolia major chains such as McDonald’s, Costa and Starbucks are now recycling their coffee cups. So now it’s your turn. We will soon be launching the coffee cup recycling scheme to help businesses recycle their takeaway cups in a much easier way. Not only will this add another dimension to your recycling practices, but it is also great publicity to show that your business supports a sustainable approach to recycling. To hear the latest news on the coffee cup recycling scheme, be sure to register your interest below.